All tickets are $5 per day and will be sold at the door. As this is a funraiser for the schools, no passes of any kind will be accepted. This annual fundraiser has returned over $140,000 to schools in the Greater Muskegon area since its start in 2002. 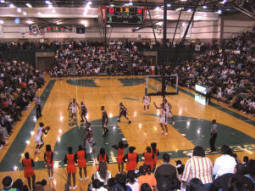 In December of 2002, the Hall of Fame made the jump into tournament sponsorship with the launch of a high school basketball event. Featuring four schools from the Greater Muskegon area, the goal was to provide sports entertainment over the Christmas break, and to create a new fundraising opportunity for the schools that participate in the event. Christened the Hall of Fame Basketball Classic, proceeds from the contests are split five ways between the four schools and the H all of Fame. The format includes varsity, junior varsity and freshmen contests. 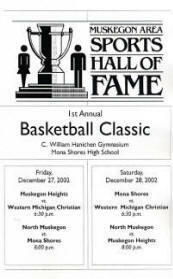 Initially, varsity games were hosted at Mona Shores High School that first year, and included contests between North Muskegon, West Michigan Christian, Mona Shores and Muskegon Heights spread over two consecutive days. Featuring NCAA Division 1 recruits Drew Naymick of North Muskegon (Michigan State), and Eddie Spencer of Muskegon Heights (Central Michigan), the success of the concept was quickly apparent. Sellout crowds meant a new home for the varsity contests in year two. The Classic was moved to the spacious facility at Reeths-Puffer High School and again "packed 'em in". On Friday, Shelby replaced North Muskegon and on Saturday evening, the match-up between Muskegon and Muskegon Heights attracted a huge crowd of 3,400 spectators. Over the years of tournament action, 24 separate school spanning West Michigan and the state have played in the annual tournament. Today, the Meijer Hall of Fame Classic ranks among the longest-running Christmas tournaments in the state of Michigan. Thanks to an outstanding group of donors and volunteers that help stage the games, and the popularity of the event, the Classic has been able to return well over $140,000 to help area athletic programs.